Jim will be discussing the correlation between the painted lighting styles of the Master’s and how it relates to our photographic lighting today. Jim is a life long educator and artist classically trained, graduated and awarded his MFA or BFA/MA equivalent from the Ruskin School of Drawing and Fine Art, University of Oxford, England. Jim also has a Master’s Degree in Art Education from Nazareth College in Rochester, New York. Most recently Jim was a Foreign Cultural and Educational Expert/Visiting Professor in the PEOPLE’S REPUBLIC OF CHINA. Please join us for an extremely Educational afternoon filled with LOTS of great information! Paul and Brent gave a great program in February! Thanks for all the information about Route 66. 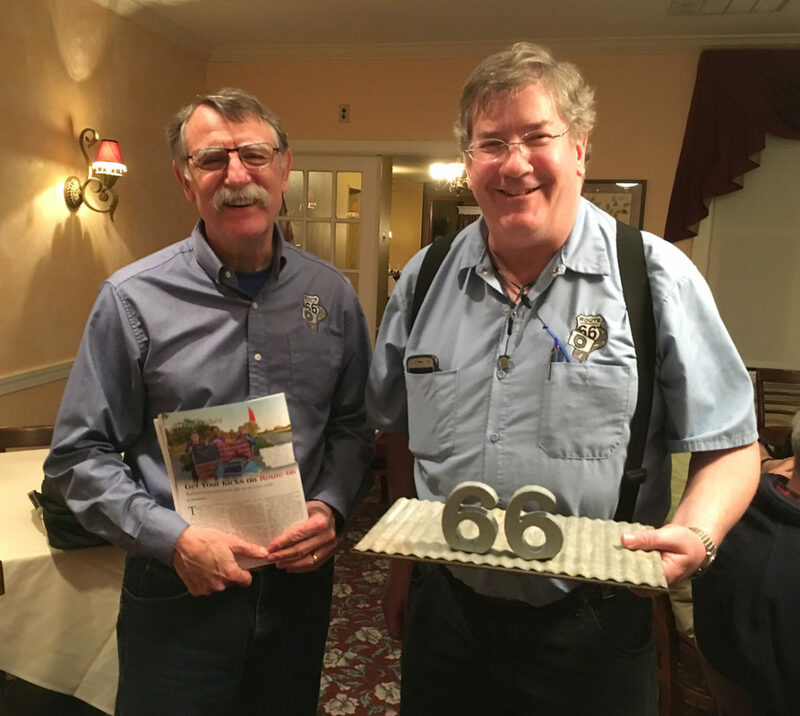 Paul Bardotz (L) and Brent Walton (R) hold a copy of 55+ Magazine that features a story about their trip. MARCH 24-26: PPSNYS Focus Convention IT’S NEVER TOO LATE TO REGISTER! APRIL 18: GOING OUT OF BUSINESS TOUR AND SALE at Personius-Warne Studios in Elmira! Craig and Linda are planning to close the over 100 year old Studio and have so much equipment they can’t even find it all! We’ll hold our meeting there to say good bye to an icon. We will be taking the tour of the premises and seeing what goodies we can take off their hands at very reasonable prices. Craig and Linda will be moving the business to a smaller space in their home. JUNE 20: Guided tour at Montezuma for nature and wildlife photography.